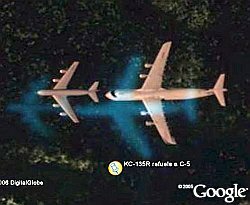 Google Earth Blog: KC-135 Caught Refueling C-5 Galaxy in Mid-Air in Google Earth! KC-135 Caught Refueling C-5 Galaxy in Mid-Air in Google Earth! Yesterday, someone was looking around at Lava Fields in northern California, and came up with his first discovery of a plane in flight. Only, this one was a really BIG find: a KC-135 refueling a C-5 Galaxy in mid-air! It was posted by someone called "Helomech" at the Google Earth Community (GEC). This is a fantastic find and is on a par with the Lancaster bomber found flying in the UK. The refueling shot is a satellite photo. The "blue ghost" double image is actually an artifact of the satellite photo and is due to the motion of the two planes. In fact, if you look closely at cars on highways in satellite photos, you will sometimes see these ghost images for those moving objects as well. The distance of the ghosts from the actual objects is an indicator of speed. Those of you who are regular readers know one of my Google Earth hobbies is to look for aerial or satellite photos which have captured planes in flight. There are actually a number of people at the Google Earth Community who share this hobby, and there is a "database" of placemarks which show all of the planes in flight found to date. The placemark collection is constantly changing because Google updates the imagery database on a regular basis. If you find a plane in flight (or planes), you should check first to see if its already in the database. Here is a network link for the database of all the known planes in flight around the world. I like the airport at Frankfurt Germany, as for some reason there are 3 Luftansa 747s taking off almost in some sort of a formation. You can see them (and their shadows) just to the east of the main runway (at least on maps.google.com). I took a look at those planes at Frankfurt International, and something very weird is happening there... I think they may all be the same plane. Check out the traffic below the middle plane. The shadow indicates the sun is in the south west. Notice the shadows of each of the three planes (which are north and slightly east of the planes). You can't see a shadow for the eastern-most plane (maybe the plane has gained enough altitude to lose its shadow, or its the terrain). The shadow for the middle plane is hard to see, its not on flat surface, but it is there. The western-most plane has the most distinct shadow. I think maybe this planet could be an imposter! I haven't seen an airplane on Google Earth before, but isn't it weird that the shadow of the airplane seems to be over the airplane itself? Look closely, specially at the shadow of the tail section. umm... Sinan... read the story. cm and andrew: the plane(s) in Frankfurt, Germany are a differnt kind of aerial photo artifact. In this case, the same plane is captured several times because of the scanning process. The plane is faster than the photo capture so it gets captured several times. In one case, the composite image is missing the shadow of the plane (because the plane was gone before that portion of the photo was taken). I saw a similar view (from the ground) two weeks ago when my Wife and I were camping near this location. I commented to her about the two planes mating. The photo of the north runway at London's Heathrow airport shows the sample multiple-plane effect very clearly. Normally Air Refueling is conducted at an altitude around 27000. In the shot of the KC-135 and C-5 you still see the aircraft when you get down to around 6000 feet. I have no doubt that this is a photo of an inflight refueling, but why the anomaly? CrewRest - all the aerial/satellite photos are 2D pictures mapped onto the Google Earth terrain. Although the planes were at altitude, they are not 3D so the image is mapped at the same height as the ground. So far I've found a small plane over the water in Southern California, a U-2 over the runway up north and a heliocopter over the ocean down south. This is the neatest tool I've ever used. If anybody wants to see the planes I found, post back. It would seem to be more fun to look by yourself than just be told where they are exactly. I have the latest version of GE, according to the "check for updates" feature in Help, and the image I have of that is incredibly blurry. Are you using a professional version or something? of the blurriness). So, my image of the scene was also blurry when viewed this close. get the best images Google has available with the free version. I wonder about the explanation above. Why would the ghost be *ahead* of the plane if it is an artifact of its motion? Note that this shot was taken over water (Tule Lake), could the "ghost" really be a reflection of the planes off the water surface? Just food for thought. Does anyone know about how close we are to getting real time images or at least within the past couple of days old? Very nice... those who want can also see a plane leaving Congonhas airport in Sao Paulo, Brazil. I think it's an A320, from TAM airlines, at 23d 38'46.59" S 46d 38'34.49" W. Enjoy it. I just found this myself. I'm a nature photographer, and I shoot at Tule Lake a lot. I thought it might be a relic of WWI or something, since the area has a lot of history. It's too small for scale though. I first thought it was a hoax (I don't even know if that's possible), so I measured the lat/long of the nose and tail of the C-5A and calculated the distance - the result I got was 79.4 meters, and the actual length of a C-5A is 75.3 - close enough! The Jet Fighter is 20.2 meters long, consistent with what a jet fighter could be - it is also in the vicinity of Edwards AFB.